This page does not address the “division by zero” errors that can occur when evaluating formulas. This page deals with repeated “division by zero” errors a user may experience while booting or starting Control. A user or users across the network attempts to login to Control and receives repeated errors, “division by zero.” When Control eventually launches, normal operation is impossible due to the frequency of the error. Normally when division by zero errors are seen, they occur when a pricing form is openned and signify a formula error, such as a quantity being divided by a variable or a UDF that has no value. In this case however, the error occurs during boot and will occur often but sporadically when Control is open. 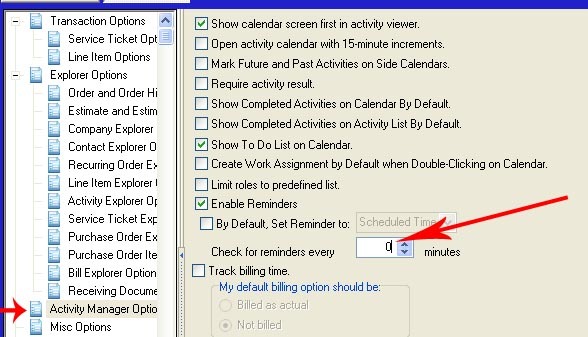 A cause of this error is when the ReminderInterval value in the UserOption table is less the minimum (5). Make sure that “Check for reminders every ___ minutes” has a value of at least 5. Click save on the Action toolbar to the right of your screen.